In Chaucer's London, betrayal, murder, royal intrigue, mystery, and dangerous politics swirl around the existence of a prophetic book that foretells the deaths of England's kings. 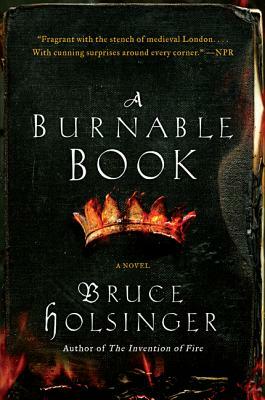 Bruce Holsinger's A Burnable Book is an irresistible historical thriller reminiscent of the classics An Instance of the Fingerpost, The Name of the Rose, and The Crimson Petal and the White. London, 1385. Surrounded by ruthless courtiers—including his powerful uncle, John of Gaunt, and Gaunt's artful mistress, Katherine Swynford—England's young, still untested king, Richard II, is in mortal peril, and the danger is only beginning. Songs are heard across London—catchy verses said to originate from an ancient book that prophesies the end of England's kings—and among the book's predictions is Richard's assassination. Only a few powerful men know that the cryptic lines derive from a "burnable book," a seditious work that threatens the stability of the realm. To find the manuscript, wily bureaucrat Geoffrey Chaucer turns to fellow poet John Gower, a professional trader in information with connections high and low. Gower discovers that the book and incriminating evidence about its author have fallen into the unwitting hands of innocents, who will be drawn into a labyrinthine conspiracy that reaches from the king's court to London's slums and stews—and potentially implicates his own son. As the intrigue deepens, it becomes clear that Gower, a man with secrets of his own, may be the last hope to save a king from a terrible fate. Medieval scholar Bruce Holsinger draws on his vast knowledge of the period to add colorful, authentic detail—on everything from poetry and bookbinding to court intrigues and brothels—to this highly entertaining and brilliantly constructed epic literary mystery that brings medieval England gloriously to life.